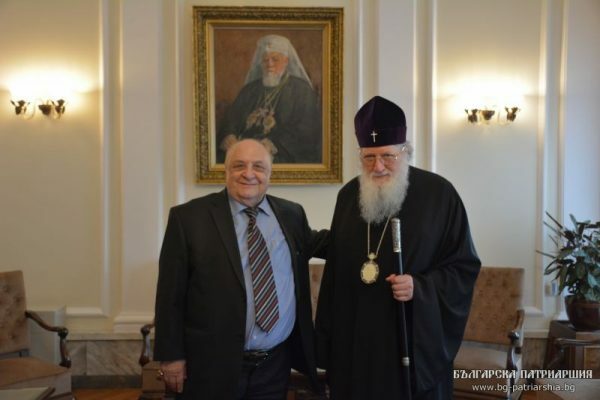 The head of the Bulgarian Orthodox Church, Patriarch Neofit, held talks on March 31 with Moshe Aloni, one of the initiators of the nomination of the church for a Nobel Peace Prize for its role in preventing the deportation of Bulgarian Jews in 1943 to the death camps of the Holocaust. “It’s an honour to kiss the hand of the Primate of the Bulgarian Orthodox Church, that Church that defended Bulgarian Jews at a time when it was not difficult to disappear, to be killed,” Aloni said, according to a statement by the church’s governing body, the Holy Synod. “The whole world and our leaders need to know what is true Christianity, evidenced by Bulgarian bishops in tough times, to understand what humanity is, and the nomination of the Bulgarian church for the Nobel Peace Prize gave us occasion to promote this unprecedented example,” said Aloni, a Bulgarian-Israeli lawyer. Aloni said that whatever the outcome of the nomination, the main objective has been achieved because people around the world have learned about the heroism of the Bulgarian Orthodox Church in the rescue of Bulgarian Jews during World War 2. A great many letters had been received from around the world to support the nomination and expressed respect and admiration for the Bulgarian Orthodox Church. The actions of the Bulgarian Orthodox Church were described as a significant event not only for Bulgarian history but for the history of humanity. It was an example of the assertion of the eternal human values in all circumstances, of dignity, integrity, heroics and kindness to every neighbour regardless of the nationality and faith, the statement said. During World War 2, Bulgaria was allied to Hitler’s Germany. Prompted by the church’s top clerics and some political and civil society leaders, backed by a huge stream of letters from ordinary Bulgarians, the authorities in Sofia refused to hand over Bulgarian Jews for deportation to the Nazi Holocaust death camps where more than six million Jews were mass-murdered. In territories of Yugoslavia and northern Greece, nominally under Bulgarian control, more than 11 000 Jews, who did not have Bulgarian citizenship, were deported and most were murdered at the Treblinka death camp. In 2013, when it commemorated the 70th anniversary of the prevention of the deportation of Bulgarian Jews, the country acknowledged and expressed regret that the Jews in these territories had not been saved. About 20 Bulgarians from that era are honoured as “Righteous Among the Nations” at the Yad Vashem Holocaust memorial museum in Israel.